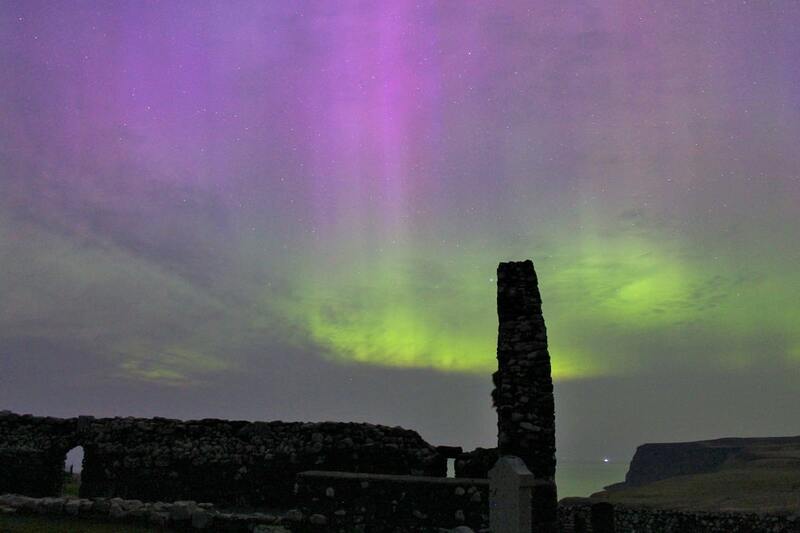 Waternish Peninsula – home to three Dark Skies viewing sites has been the perfect location throughout our stormy winter from which to view the Aurora Borealis. When the skies have been clear we have enjoyed numerous light shows that have been on display since October (even when there have been no aurora warnings). However nothing has been able to compete with our latest spectacular on Tuesday 17th March 2015. All day the Aurora alerts had been coming in thick and fast and it literally kicked off as soon as it was dark enough to see. 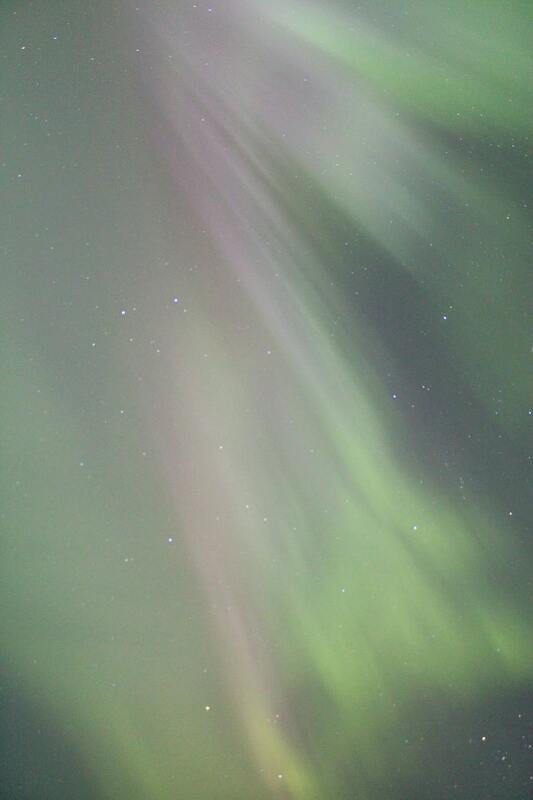 Throughout the night we were an audience to dancing rays of light ranging from green to pink to purple, initially coming from the north but by about 10pm you could more or less see it with the naked eye anywhere in the sky. The Storm Force Aurora reached it’s highest levels in over 10 years at a magnificent kp8.85 (which is pretty brilliant in Aurora levels!). With the Apps now available both online and on your phone a kp 4 plus will start to give a lovely green glow in the north tinged with purple or pink around the edges. 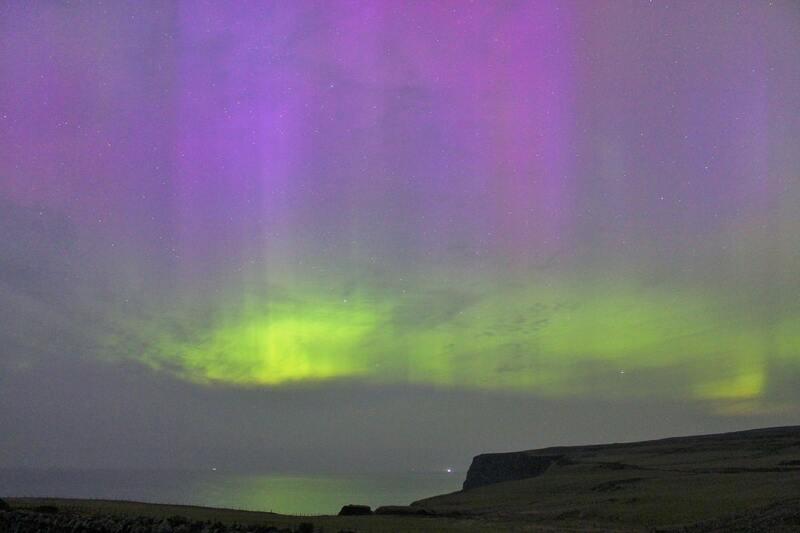 The Higher the kp level the stronger the Aurora. You can only see the Aurora when it is fully dark. If you are not sure what you are looking at, get your eyes accustomed to the dark, look around you to the south and then back to the north where the first thing you become aware of is a silver glow spreading from the horizon upwards. This silver glow will look green on camera. We still have a few more weeks where we can enjoy Dark Skies and hopefully many more Auroras to enjoy so get out there make the most of our beautiful planet.